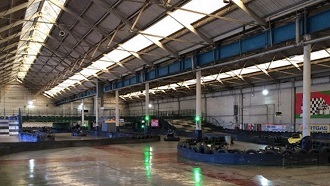 An excellent multi-level kart circuit close to the centre of Southampton. The venue has a fleet of petrol powered karts and the professional team will ensure that your event goes off without a hitch. As well as good catering facilities and a bar the centre is also ideally placed for corporate groups in the Southampton/Portsmouth area. Exit M27 at J4 on to the M3 north towards Basingstoke and London. Exit M3 at J13 towards Eastleigh and continue on for about a mile through all the traffic lights and across the crossroads until Leigh Road becomes Romsey Road passing Eastleigh Police station on your left. Go through two further sets of traffic lights until you reach the roundabout at Eastleigh railway station where you should take the third exit on to the B3037. Continue for 250 metres until you reach the Esso petrol station on your right and at the mini roundabout turn right into Chickenhall lane. Take the second road on the right into the Barton Park industrial estate; the track is in the last building on the right. Exit M27 at J5 towards Southampton Airport and at the large roundabout take the fourth exit on to the A335 and follow the signs to Eastleigh. At the next roundabout take the first exit left continuing on the A335 past Southampton Parkway railway station. Continue past Eastleigh railway station on your right and at the next roundabout take the fourth exit right on to the B3037. Continue for 250 metres until you reach the Esso petrol station on your right and at the mini roundabout turn right into Chickenhall lane. Take the second road on the right into the Barton Park industrial estate; the track is in the last building on the right. Exit M3 at J12 towards Eastleigh on the A335. Go straight over the first roundabout and continue until you reach the next roundabout in Eastleigh town centre. Take the second exit on to the B3037 and continue for 250 metres until you reach the Esso petrol station on your right and at the mini roundabout turn right into Chickenhall lane. Take the second road on the right into the Barton Park industrial estate; the track is in the last building on the right.